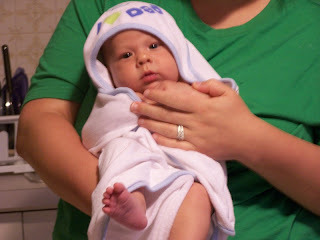 This is after Levi's very first bath. And this picture was taken last week sometime. Levi loves his baths. He is already splashing around, unintentionally, but still gets water all over. Bath time is my favorite. I love to play with Levi while getting him clean, and the time we spend together while massaging lotion onto his smooth skin is wonderful. I will always cherish these memories. But, the best part perhaps, is that it quickly calms him down. 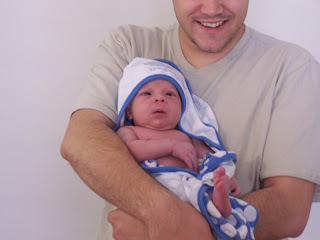 On the nights that he is fussy and nothing else will help, we fill the tub and stick him in. Within moments he relaxes and usually has a large smile on his face. We then continue to splash and clean as long as he stays content or the water gets cold. On another note- Levi had his 2 month check up today. He weighs 12 pounds, 9 ounces, which places him in the 75th percentile. He is 24.5 inches long, and is in the 95th percentile for length. He is doing great. He also had his shots today. That was a very sad moment. Fortunately, he calmed down quickly and has not had any side effects. he's lucky to have you both for parents. hope to see him soon.